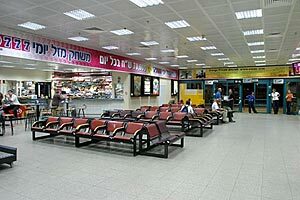 Dov Hoz Airport, commonly known as Sde Dov, serves mainly for domestic flights to the north of the country, to Ein Yahav and to Eilat. The majority of international activities at Sde Dov take place in summer, by Arkia and Israir, to short hop destinations, and private flights departing from Terminal 2. Sde Dov is located in the Dan Region, close to one of the northern suburbs of the city of Tel Aviv, and at present also serves the military. The Airport was handed over to the Airports Authority for operation only. Arkia Airlines and Israir Airlines operate from the Airport, which serves as their home base, El Rom Airlines and other airlines operate flight services, such as: Romantic / pleasure flights over the country, , air taxis and helicopter flights. 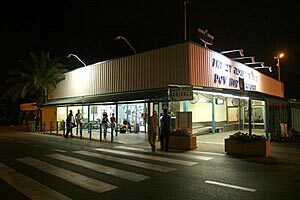 In 1997, Sde Dov was declared an International Airport for private flights. Additional Information: International flights can be conducted for Israeli pilots only. Non Israeli can use BGN airports for inbound. ATM machining. OPR HOURS Opr 0600-1400Z++ Sun-Thu. RSTD Avoid ovft of Shikun-Lamed residential area E of arpt. PPR for jet opr.